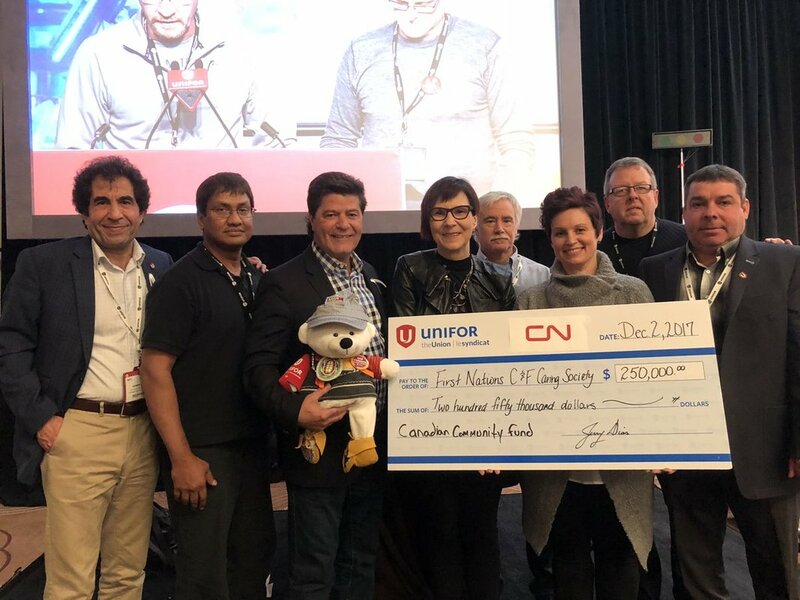 Unifor and CN, through the Canadian Community Fund CN Rail Project, have donated $250,000 to the First Nations Child and Family Caring Society of Canada. Unifor represents approximately 6,000 CN employees. The donation, presented today at Unifor’s Ontario Regional Council in Toronto, comes from the Canadian Community Fund which is jointly run by Unifor and CN to support programs with a focus on women and aboriginal causes. “CN is proud to partner with Unifor to help this wonderful charity and invest in the Spirit Bear Project which supports the First Nations’ Child and Family Caring Society of Canada’s efforts in protecting the safety and wellbeing of First Nations children,” said Suzanne Fusco, Senior Human Resources Manager, CN. ​The donation will support the Caring Society’s reconciliation-based activities, centralize reconciliation learning on its website, translate materials into French and five Indigenous languages and distribute to low income schools free of charge. ​Unifor is Canada’s largest union in the private sector, representing 315,000 workers in every major area of the economy. The union advocates for all working people and their rights, fights for equality and social justice in Canada and abroad, and strives to create progressive change for a better future.